Shavuot, the holiday that marks the giving of the Torah (The Pentateuch) on Mt. Sinai, has come and gone, and I hadn't made the traditional cheesecake to celebrate the occasion until a week later. Truth be told the holiday is rather unremarkable. As soon as I "utter" the word "unremarkable," I choke on my words when I remember my post from last year No-Bake Blueberry Cheesecake about Shavuot. A year ago I wrote about an unorthodox practice during Shavuot which includes my mom's mischievous behavior and its origin. What I hadn't touched last year was the connection of cheesecake to receiving the tablets on Mt. Sinai in the desert. The Kosher laws were given to Moses for the first time on Mt. Sinai. Since the Israelites didn't yet quite know how to butcher in a Kosher manner, they stuck to dairy, until the mysteries of the new laws unfolded. There are other fascinating reasons behind the dairy on Shavuot, such as numerical values which I find mesmerizing, among others you can read here....and on the Book of Ruth the scroll that is read on Shavuot, I'll write next year. Turns out "unremarkable" is far from the right characteristic of this holiday. Author's note on the cake: This is not your traditional NY style dense cheesecake. It's feathery, as if you are eating white clouds. It's as delicious as I remember it from my childhood. Put an oven safe pan full of tap water in the bottom rank of the oven and preheat the oven at 464F. Grease a 10 inch springform round cake pan, line the bottom and sides with parchment paper and grease the parchment paper. Beat the egg whites in a mixer with whisk attachment on medium high speed for about 2 minutes until frothy. Add the sugar gradually while increasing the speed to higher (but not at the highest) and whisk for 2 minutes longer. Increase the speed to the highest setting and whisk for 2-3 minutes longer until the egg whites soft peak but aren't too stiff. Do not over beat. Whisk into a separate large bowl the egg yolks, vanilla, quark cheese, sour cream and cornstarch and whisk manually for a couple of minutes until the mixture is smooth. With a rubber spatula fold the egg whites in batches into the cheese/egg yolk mixture until incorporated well. The mixture will be thick and liquid-like but will still hold its volume. Pour the cake batter into the pan and bake in the middle of the oven for 15-20 minutes (at the most) until the top is golden and the cake puffs. Reduce the heat to 320F and continue baking for 1 hour and 10-20 minutes longer without opening the oven for the entire duration of the baking. The cake will be somewhat wobbly in the middle, not completely set yet. It will set while cooling down. Turn the oven off and leave the oven door ajar to let the cake cool down slowly. Refrigerate overnight covered with plastic wrap. The cake is best served chilled overnight. The next day release the spring form and gently remove the parchment paper around the cake. I do not recommend removing the cake from the bottom cake pan base. Move to a serving cake stand, slice and enjoy at breakfast, as a dessert or with tea. Author's notes: I followed every rule in the book to keep my cheesecake from cracking but tiny little cracks did show up. The cake was light and delicious regardless. I also combined different recipes and techniques and made this recipe my own. Keep in mind ovens vary. It looks heavenly and wonderfully light! I love the texture of this! It looks luscious! I hate to admit it but I've never tried Quark cheese, after seeing this now I must! Quark cheese is huge in Israel. As savory schmear and in sweets too, but really you'll find it in every household there in the refrigerator. 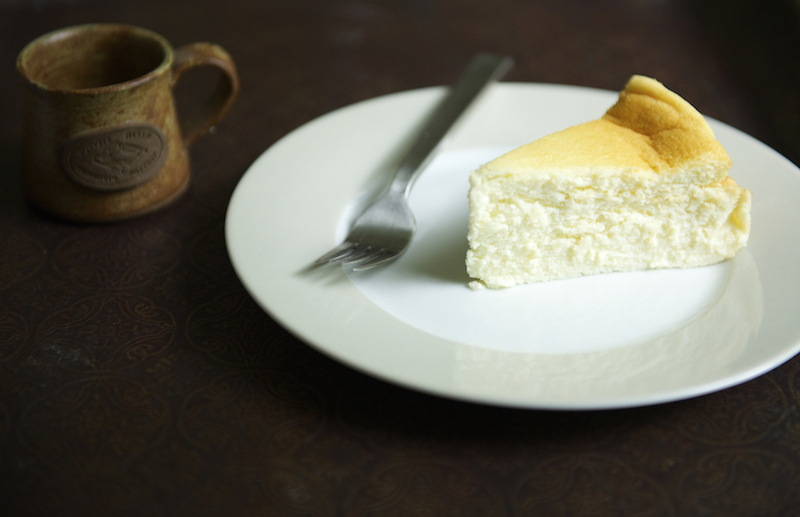 This cheesecake sounds wonderful and I enjoyed learning more about the holiday! Haha Erin, your honestly is refreshingly hilarious! I get what you are saying though. I think I saw some recipes calling for less than 1 cup which I can't imagine given the quark & sour cream. Even at 1 cup is was pleasantly but not overly sweet. The way I like it. Quark was brought to Israel by German Templars (I wrote about it last year:). I had no idea cheesecake was traditionally eaten during Shavout. I feel like my parents failed me in my teachings growing up and clearly we should have had more cheesecake (although dairy was plentiful)! I've never tried quark but this does look light and lovely. I love the lightness of this cake, it looks heavenly. I was like quark? All matter IS composed of quarks...is she being funny, lol! Now I get it! This looks absolutely perfect...quarks and all! I had no idea about the connection between cheesecake and the tablets! What a beautiful cheesecake this is, Shulie. I've never heard of quark. Learn something new every day. This cake looks incredible!